View showing more of the pattern. 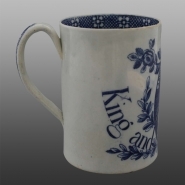 A cylindrical earthenware mug printed in the King and Constitution pattern. 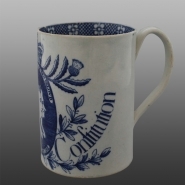 This pattern was produced in 1793 at the outbreak of war with France following the execution of King Louis XVI. Although not marked, it has been attributed to the Cambrian Pottery, Swansea.